Gurney Journey: "This isn't how it looks." 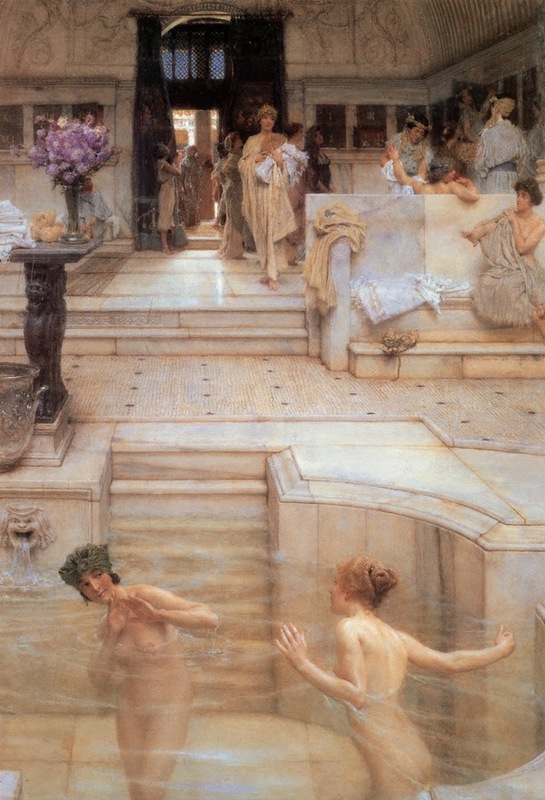 When Lawrence Alma Tadema painted bathers in a pool, he chose to ignore the way refraction distorts the figures below the water, and painted the water surface like a semi-transparent veil. This must have looked right to him and his collectors, but it looks wrong to us, accustomed as we are to fast action photography of water. We often assume that all we have to do is look at nature to see it as it truly is, but in fact our perception of reality is even now bound by our culture. Given that our visual culture includes such things as movies that we can stop-frame, YouTube videos, selfies, and paintings of all sorts, our idea of what looks right keeps evolving, shaped by all these artistic forces. Here's another example. 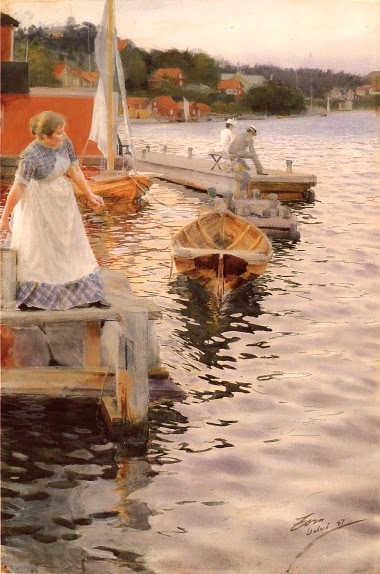 Anders Zorn's virtuoso watercolors of harbor views strike our modern eyes as extremely realistic. But according to Zorn's early biographer, "It is said that when these watercolors were first exhibited in Stockholm they aroused the anger of the older connoisseurs and called forth the usual phrase—'This isn't how it looks.'" The use of photos versus not using photos? Its an interesting phenomenon in modern landscape painters as well to see the influence of photos even on painters who refuse the use of them. As a matte painterI have to paint photoreal, when sometimes it feels better to do it painterly, thats the dilemma today. If you look at Ellenshaw mattes for Mary Poppins he used an impressionistic style in complete contrast to his photoreal work. This is true nowadays with the human body and Photoshop. We are so used to seeing photos that are airbrushed and clone stamped, normal human bodies with wrinkles and hair seem weird and unatural. I've long been a fan of Mr Zorn, especially his watercolours. There's another of his paintings, which is easy to find, of two young children sitting on a jetty, looking towards a couple of rowing boats. It's almost monochromatic, but the effect of water is brilliant. Imagine being able to paint like that and then have someone tell you 'this isn't how it looks'. That is interesting...how had these people never noticed the distortion when...wait how often did people actually bathe back then? This Lawrence Alma Picture somewhow looks funny. The bathing ladies at the forefront lightly clad in some strange veiled and watered-down stuff called "water" ha ha.. It's interesting to see some of Zorn's etchings and paintings and the photographs he worked from (some examples of the original sources still exist). He was an artist who had enough life experience that he could use photography for reference, when it proved more practical, without it being particularly evident. Naturalism vs. aesthetics. Da Vinci and other classicists knew cool shadow tones existed, they just preferred warm shadows. The same mindset is probably behind Tadema's depiction of water,and I thnk his choice is right for this picture, although he pursued a greater naturalism than they.